The PC150H offers the ease of use of a horizontal crimper with the power and precise adjustment capabilities usually found in more costly models. 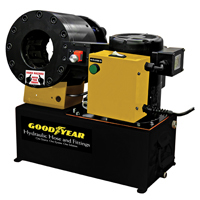 With the same crimping capability as the PC150 Series, the "H" model offers hose feed horizontally from either front or rear through a large 4.9 inch throat opening. The PC150H can be ordered with a 1 HP electric pump (PC150H-1) or a 2 HP electric pump (PC150H-2), producing maximum force in a small package. The PC150H make repetitive crimps fast and easy to accomplish with a precise, direct-read digital adjustment and a built-in cylinder retraction stop. The PC150H also offers convenience features found in both our vertical and horizontal crimpers including a pneumatic start/stop pendant switch, a magnetic die change tool, an optional die rack for storing dies and master die grease fittings as a special feature for easy lubrication. This equipment must ship via common carrier. Call us at 800.624.7760 with your Zip Code, we will gladly furnish you with a shipping quote.